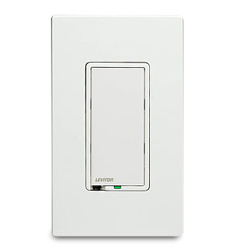 True Touch provides fingertip full-range dimming control for incandescent lighting. Touch once anywhere on the pad to turn lights ON at preset level; touch once anywhere for OFF. Touch and hold to select the precise brightness level desired. True Touch provides full-range single-pole and multi-location dimming when used with remote unit. White face assembled with Ivory and Light Almond faces included.